Xcode has a very minimalistic design when working with build errors. Sometimes it’s necessary to get more information about a failed build and it might not be obvious how to do it. The answer is simple and it’s one click away. Click on the last icon (text bubble) in the top left panel. Now select the build and you’ll see all build information. org.gradle.api.tasks.TaskExecutionException: Execution failed for task ':app:transformNativeLibsWithStripDebugSymbolForDebug'. The problem is caused by the upgrade of NDK in Android Studio to NDK v17. This version has a different structure of tools. It’s not compatible with Android Experimental Plugin v0.11. to have a MIPS64 toolchain directory. The solution is to download NDK v16 from NDK older releases. Extract it and replace former ndk-bundle directory. You can find related sample source code at GitHub in sdl2-android-example repository. Further articles about SDL2 and Android are available under the tag SDL2. Imagine the simple situation. You want to open an Android project in Android Studio. Click File, Open. 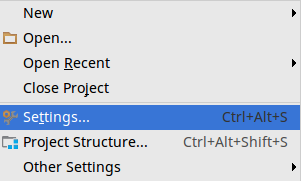 Find the project and click Ok.
Android Studio will open the project. Gradle seems to be working, but there is no Run or Debug action. Android Studio does not provide any hint where is the issue. The solution is simple. One important file is missing: settings.gradle. The file defines which modules should be included during the build. Click Sync Gradle and within few moments you should be able to run the application. If your application contains more modules, you can specify them in a similar way like in sdl2-android-example/settings.gradle. SDL2 is a well known library for making games or interactive application for Linux, Windows or macOS. The library has also support for mobile devices. Building application for Android requires a little bit more effort than build for desktops. 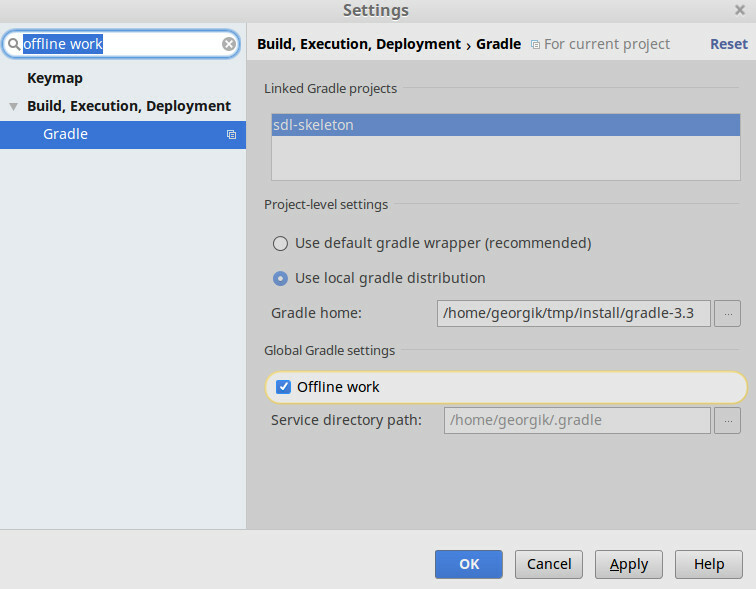 First of all download Gradle 4 and add bin directory with gradle to your PATH environment variable. Clone sdl2-android-example project from GitHub. 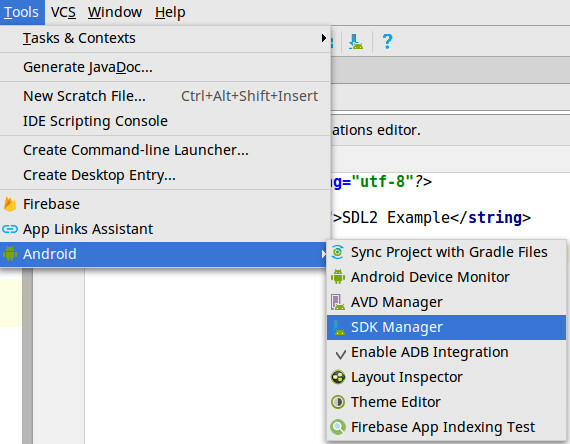 Open the repo in Android Studio and open SDK Manager. 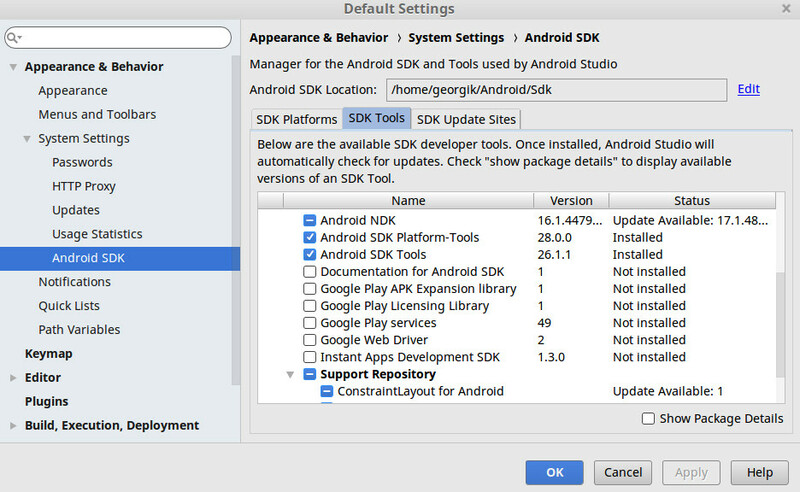 Go to Tools, select menu Android, and select item SDK Manager. In the lower right corner check option Show Package Details. 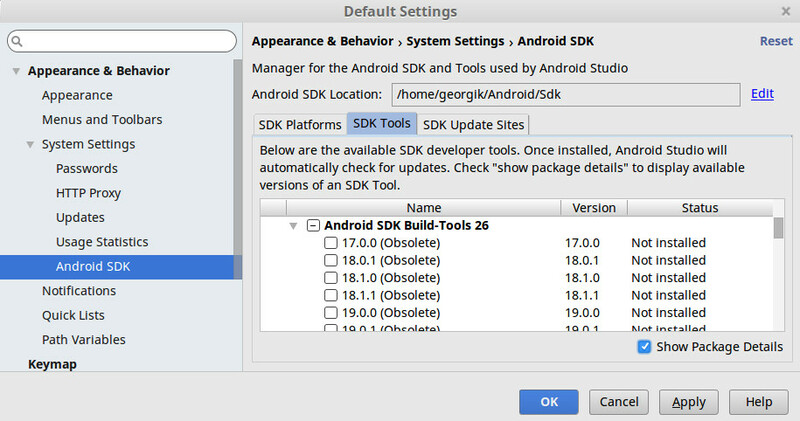 Install Android SDK Build Tool e.g. version 28.0.0 and NDK. When you open the sdl2-android-example you will see following structure. There are two gradle files in the top level directory. The first is build.gradle. The file contains a dependency on gradle-experimental plugin which is recommended for NDK builds for Android. The second Gradle file is settings.gradle. The file contains a list of modules which are in the project. One module is SDL2 library. Then there are two further modules app and main. The app module is the bridge between Java and SDL2. The main module contains C code for the application. These two files provide a skeleton for the build of the application. Each module SDL2, app and main are stored in the directory that matches the name a of module. Each module contains its own build.gradle which describes how to build the module. The module file SDL2/build.gradle is interesting because it contains many excludes. It does not make sense to build all C files from SDL2 for Android. The module file main/build.gradle contains information for linking the C application with SDL2 library. The module file app/build.gradle contains information how to wrap all the C source code into final application. Gradle will build all flavors. If you’re experiencing problems with Android Studio, just sync the project after executing this command from command line. Now you can deploy the application to a device or an emulator. Go to Gradle projects, expand :app module, expand Tasks, expand install and double click installDebug target. We will discuss how to use further SDL2 libraries in next articles. You can find more under topic SDL2. Note: the sample projet at GitHub already contains reference to other libraries like PNG. Please follow instructions described in the article SDL2_image for Android with PNG image format. The other option is to clone older version of application without PNG. Update: This article targets one particular scenario when Android builds are too slow. There might be other reasons behind your slow build. Let me know if you need assistance. Now back to original article. Gradle build should be fast. Even when you build C++ dependencies for Android. Unfortunately, it often happens that builds take forever and Gradle is not providing any hint how to speed up the build. One of the most common reasons is that Gradle is trying to download many dependencies. This will take some time even on a fast network. If you’re behind proxy it might take forever. A quick way to improve performance is to switch Gradle to offline mode. Search for “work offline”, check Work offline option and click Ok.
Next Gradle sync or build should be at least 10 times faster. 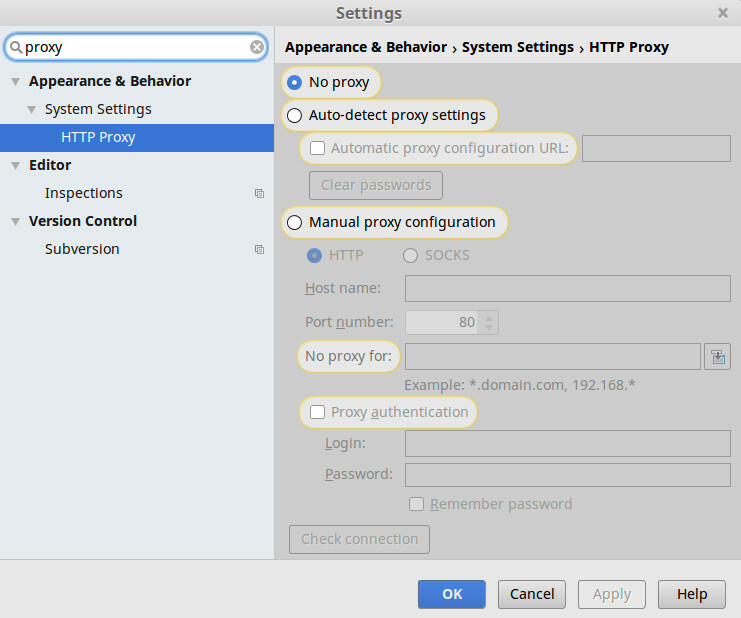 Once you’ve proved that you have this issue, go to Settings and update Proxy configuration which matches your network. If you’re still facing slow builds let me know.